Don't Have Time For A Food Journal? Try This! This is a photo of my breakfast yesterday. Thrilling isn't it? 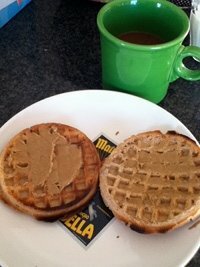 Umm, yeah, so Snack Girl has run out of ideas so now she is going to post all her meals on the site. NOT. 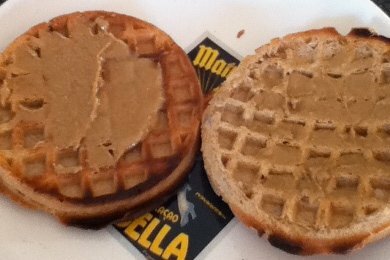 There is no particular reason that you should care that I ate 2 Van's waffles with sunflower seed butter and coffee for breakfast. It is just that for the entire day, I shot photos of the food that I ate in an attempt to keep myself accountable for what I was putting in my mouth. I used my groovy iPod touch, but almost everyone has a phone with a camera installed. The idea here isn't to share your meals with the world, but to get an idea of your diet. Sometimes you don't even realize what you are eating and grabbing your phone BEFORE you eat something will give you a pause before you eat it. Yesterday was a typical day for me so I can't make excuses about the food I ate. I will say that my job involves food and it can be tricky for me to not eat my creations for Snack Girl. I decided to share my photos in an attempt to motivate YOU to try this. After reviewing them, I realized that I really didn't need all the sugar that I had inhaled and I hope that I can learn from my photo record. 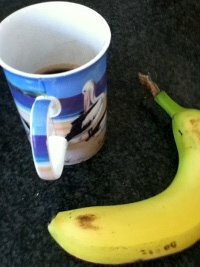 Okay, so after breakfast at about 10 AM, I had a snack of coffee and a banana. 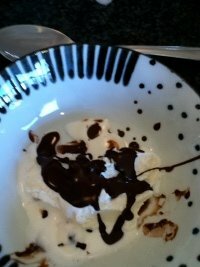 Then things roll down hill as I am trying out a new way to top ice cream with a chocolate and coconut oil concoction. Sadly, this recipe will not make it onto the Snack Girl site, but I happily ate a little to test it out. 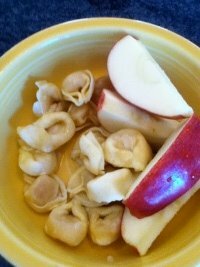 Here is my lunch - some tortellini and apple. 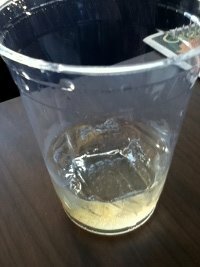 And 1/4 of the Italian soda that I drank at a local cafe with a friend. Why did just 1/4 of the soda make it in the photo? Because I almost forgot to take the photo! I just HAD to get something and hazelnut soda sounded so good. But, after the ice cream did I need another treat? Couldn't I just have had a decaf or herbal tea? 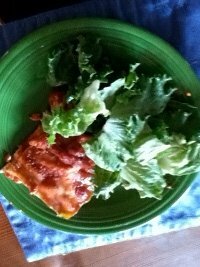 My dinner was more pasta - my kids begged for lasagna - and mine is a light version and I ate a ton of salad. 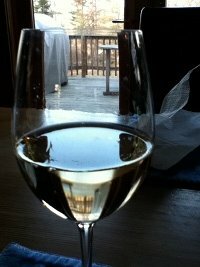 Finally, there is a glass of wine, which I could have skipped but didn't. So, as you can see, I am nowhere near perfect. It is down right painful to share this photo montage with you because I know where I trip up. If you guys want to post similar montages on your blogs, I will link to them next week and perhaps we can learn from each other. Have you tried a food photo journal? 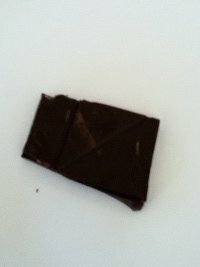 I've taken photos of The Main Street Diet ... http://bit.ly/4QikjZ It makes yours look downright healthy. I love the idea of taking photos of your food to keep yourself accountable. It's not always practical to carry a pen and paper to write it down so why not use what we all have at hand... our cellphones! I recently read that there is an app out there where you can take a picture of what you're eating and it will estimate the number of calories in it from an extensive database that they've put together. I don't get my iPhone until November but you can bet it will be the first app I get! What a great idea! BTW, I got hungry looking at your photos! Anyways, SELF will have a new blogger soon. Its a great blog, I highly recommend it! Dang, girl! That is hardly any food. How can you eat so little during the day? I would be jumping around for joy at my lost weight if that was all I ate. You know I'm a bigger person than you (6' tall for those who *don't* know me)and reasonably active, but still. I don't have a whole lot of will power. :( I should go back to either recording my food in FatSecret or photographing it. I fell off the diet jounal bandwagon big time. I was thinking the same thing... Not much food! I eat like a dang horse (mostly healthy food ;). The above pictures look like about half of what I eat in a day. I'm feeling like a pig now ;). @Shanna & @Heidi - hey, I am supposed to be on Weight Watchers - and if anyone on WW took a look at this - they would know I was not near my point goal. For me, this was a day with too many treats. The LAST thing I was thinking I would do is make people feel bad. Oh heavens! I'm in no way offended. I just happen to eat a lot of food (way more than my husband). I would do the same thing when I was on WW; eat too many treats and not much in real food volume (again, for me). Snack Girl, you are a kind woman :). Yep, I'm not good at writing down what I'm eating either, but do take photos of my food in an attempt to see at a glance what I had to eat for the day. It's kinda fun to get into the photo beauty aspect of the journaling rather than detailing every little thing that was in the bowl of food. Everyone should try this for a week straight! I love smart women!! I will be sharing this idea!! Don't beat yourself up, Lisa!! I think you did awesome. We all need a little comfort food now and then.